This Time It’s For Real, Marty McFly’s Sneakers With Power Laces Are Coming! A couple of years back, it was reported on this blog that Nike released special limited edition replicas of the Nike sneakers worn by Marty McFly (Michael J. Fox) in the movie Back To The Future, Part II. While they looked amazingly accurate to the futuristic footwear worn byMarty and lit up, they lacked that shoe’s distinctive feature: the power laces. In other words, they didn’t self lace themselves like in the movie. That was the one thing that made the sneakers so freaking cool! But fear not fans, it turns out we will be getting those special kicks after all. This past Friday, Nike designer Tinker Hatfield confirmed that next year, 2015 the year that the movie takes place in, the shoe company will release sneakers that will have the self-lacing feature! 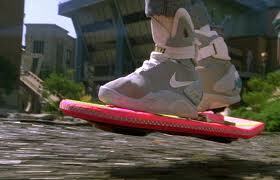 He didn’t say, however, if the power laces will be on new releases of the Nike Air Mag or another shoe. Hopefully, they’ll release the Air Mag (and not just limited editions) with the power laces. That would be sweeeet! Forget Velcro! Just push a button on the shoe and it laces itself, think of the precious seconds you’ll save when getting dressed. 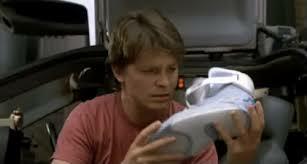 The funny thing is that these shoes that looked so futuristic back then when the movie was released in the late ’80s look so contemporary. It’s like modern fashion has caught up to the future.